A unique and slightly more exclusive ride than the well known London to Paris, this ride crosses the fringes of the West Country, via the fantastic Bristol to Bradford on Avon Cyclepath network, and Salisbury Plain before crossing the channel. On the French side we shall enjoy the beautiful Seine Valley, with its chalk cliffs, scenic villages, and amazingly quiet roads. And of course - we have the splendour of the Arc de Triomphe, the Eiffel Tower and the Champs Elysees. Get ready to ride! 4 days of riding, including 4 nights, covering some fantastic scenery and quiet roads. The Bath cycle path, through the all new tunnels to Bradford on Avon, before turning south to Salisbury Plain and the historic Cathedral city of Salisbury. We continue down to the fringes of the New Forest, before an overnight ferry crossing on night 2. Day 3 will see us ride on down the Seine via some scenic country routes - and including a stunning crossing of the River at Tancarville. 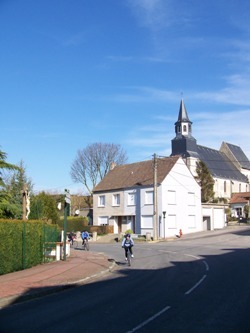 The countryside is very special and Day 4 certainly doesn't disappoint, with undulating, winding and fast roads leading us through a procession of tiny villages, each perfectly equipped with 'un café' et 'une patisserie' - pain au chocolat anyone? 08:00 - Following Briefing & Bike Checks and loading Van - depart towards Bath Ride to Salisbury. 09:00 - Depart on the bikes. 06:30 - Breakfast on board ferry. 08:00 - Ride off ferry to Evreux. 14:39 - Arrive St Pancras Intl Station, London. Adventure Cafe team will return bikes to Bristol for you, either on the same afternoon - or the next morning/ PLEASE NOTE: You must check-in at least 60 mins before departure at Paris Gard du Nord. The Gare du Nord is not the easiest station to navigate - make sure you arrive in good time!! 2-3 star clean good quality hotels - including buffet breakfasts. You should be in good health to participate in this challenge. If you have any medical conditions, you must consult your doctor and ensure that you are OK to participate. All medical conditions and recent operations, as well as allergies must be disclosed on your booking form. You should be used to cycling - and you should also be used to taking exercise. This itinerary can run from April through to October - weather can vary from chilly through to very hot in mid summer. We need to prepare for the full spectrum of possible weather conditions.